Bert A. Phillips was his name, but back in the 1940's and 1950's, fans were more familiar with Foreman Phillips. Foreman served in the U. S. Navy during World War I. After his discharge, he began work as a salesman for radio station KFWN, selling ad time. In 1935, he became the sales manager for Don Lee of the Mutual Network. It was then he started one of his hit radio shows, "Western Hit Parade Show". His popularity continued to grow and perhaps peaked when started hosting his popular County Barn Dances in 1941. It appears the first venue for these events was the Venice Pier in California. Then he leased space at other locations such as Compton, Baldwin Park and Culver City. Billboard magazine included a short mention in their 1943 yearbook that the Los Angeles County Barn Dance at the Venice Pier was so popular, it led him to open other venues in the Los Angeles area. Janie Hamilton wrote a bit about Foreman Phillips in her "West of the Mississippi" column in 1944 that give a little insight into what he was doing on the Los Angeles country music scene back then. He was doing programs over two radio stations at the time by recording them. He was on KRKD and KPAS. In fact, one of his shows was a 30-minute 'news show' that was not the typical entertainer or disc jockey spinning records type of show it seems. Instead, it was almost promotional in one aspect - he provided a news program that revolved around the country music entertainers that were probably appearing at the several venues he was managing. But 1944 may have been somewhat of a turning point for Foreman and his shows. Variety reported that box office receipts for venues featuring western style music had dropped for about four consecutive months. It was noted that even recordings and sales of western clothing had dropped during that time. But they also noted that promoting the western 'fad' of music made Foreman a "millionaire". We can infer from several sources that Bert (Foreman) Phillips took advantage of an opportunity he saw during the World War II era in Los Angeles. There were many war-related industries in the area and he found that they enjoyed going to dances and especially those that featured country music. He wasn't a performer. But he reached his audiences as a disc jockey for stations in the area and gave him the ability to promote those dances. Foreman was cited in one 1944 article in Billboard for the success he had seen. At the time he was said to have several popular programs ariing over KRKD. He wrote them in a letter, dated July 18, 1944, that he had just finished his 173rd consecutive week with his "Western Hit Parade" program. He told the magazine, that the Top Ten hits he played or mentioned each week was not based on record or sheet music sales, but rather, dictated solely by the listening audience, noting that he received 6,000 votes a week. Doing the math, that's over 1,030,000 votes in that time span. Does the success of the U. S. Post Office owe some debt of thanks to early country music radio? Gerald W. Haslam wrote in his book, "Working Man Blues" about country music history in California that the Los Angeles County Barn Dance at the Venice Pier Ballroom was started by Foreman in 1942. He sensed he had a good thing going and soon was leasing the Town Hall Ballroom in Compton, California, the Plantation in Culver City, the Baldwin Park Ballroom and for a short time, the Riverside Rancho. Mr. Haslam notes that Foreman booked major stars of that era that gave audiences something else to enjoy in addition to the house bands and artists that included such names as Ray Whitley, Al Dexter, Ted Daffan, Space Cooley and Hank Penny. Spade Cooley played the Venice Pier Ballroom for Foreman for some 74 weeks according to a 1944 mention in Billboard magazine. One of his popular dance venues was the Venice Pier Ballroom in Venice, California where he consistently drew audiences in the thousands. Artists such as Bill Boyd, Roy Rogers, Bob Wills, Roy Acuff, Bob Atcher and Bonnie Blue Eyes made appearances at the Ballroom. Ms. Hamilton writes that it was a "...the ballroom is (was) a mammoth affair". She said it was in a colorful western setting that combined new and old music and often would feature several square dances each night. In 1944, Ted Daffan and His Texans were one of the acts that appeared at his Venice Ballroom shows. Spade Cooley seems to be someone that was a catalyst for what Foreman developed in Los Angeles. A 1945 article notes that Spade was a large part of Foreman's success during his time at the Venice Pier Ballroom - drawing on average 5,000 to 7,000 people to his dances. It is interesting to note that the term, "western swing' is often attributed to Foreman Phillips who used it to describe the music Spade Cooley would play, and called him the King of Western Swing, perhaps influenced by the moniker given to Benny Goodman of that era as the King of Swing. Spade gave credit to Foreman for the 'encouragement' he provided in booking him at his venues in a 1953 question and answer article. But even though he is given credit for coining that term, he may not have really known what was behind its popularity back then. We have seen more than one reference that indicate that Foreman was quite the stickler for what he wanted the bands to play at his venues - a sign was posted "Stick to the Melody". But it is pointed out that dance bands want people to move, not just sit or stand and listen to the music, so the bands put emphasis on the beat and rhythm along with the melody. In 1945, Foreman continued to add new acts to the venues he was operating. In June of that year, Zeke Clements had left the Grand Ole Opry and moved to the west coast. Readers will note that Zeke was the voice in a Walt Disney classic during those years. Another act that came to work for Foreman at his County Barn Dance shows was Curly Williams and His Georgia Peach Pickers. In fact, it was written that Foreman had signed Curly and his group to a long term contract. Roy Acuff was signed to an appearance at the Venice Pier Ballroom on November 3 and 4 in 1945. This was part of a trip to Hollywood that began on October 20, 1945 to make the movie, "Night Train To Memphis". One of the acts he had at his venues lost his job with Foreman's shows because he didn't stick to the melody and was known for his sometimes jazzy guitar licks - Hank Penny. He was eventually let go by Foreman and Hank went on to open one of southern California's legendary country music night spots - the Palomino Club on Lankershim Boulevard. Like any business operation, one wonders where Foreman would base his promotional, musical efforts. In early 1946, he moved his County Barn Dance operations into what was known as the Spring Arcade Building in Los Angeles. In 1947, Foreman Phillips had 20 hours of air time for his shows that aired over KRKD, KXLA and KFOX in the Los Angeles area. Foreman was also promoting country music beyond the venues of his popular County Barn Dances in the Los Angeles area. Billboard noted in 1947 he had helped Roy Acuff finish a tour of 58 one-nighters in California, Washington and Oregon over a 60 day period. In November of 1947, Foreman Phillips took leave of his shows over KRKD that he had hosted for nearly ten years. Cliffie Stone took over hosting the "Western Hit Parade" show. Art Wenzel was one of the names who played for Foreman's 'County Barn Dances'. Foreman was known to either emcee the shows or just be the person behind organizing and managing the various venues he ran. Phil Brooks was a DJ on KRKD in the late 1940's and was running the County Barn Dance in Baldwin Park. Another act that worked for one of his dances was the McQuaig Twins. Hank Caldwell was another performer with links to Foreman. Sunny Ciesla, a columnist for National Hillbilly News often covered the Southern California country music scene. More than once she bemoaned the fact that she had not been to all of the venues that Foreman had going at the time. She noted he had 'many shows'. We turn the pages to September of 1948. Foreman was still operating his County Barn Dances at the Town Hall in Compton and in Baldwin Park. Ted Daffan was the main headliner at the Town Hall while Eddie Cletro and his Roundup Boys were the main act over in Baldwin Park. 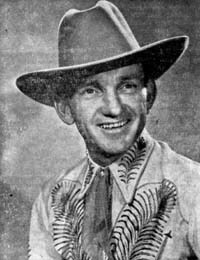 In May of 1949, Billboard reported that Johnny Bond had been doing guest spots at the Foreman Phillips club in Compton after an extended tour with Gene Autry. This perhaps begins the blurring of the shows that eventually evolve into legendary Town Hall Party. Foreman returned to the radio in March of 1950, again doing his four hour nightly show over KRKD. Again, we seem to sense where history is blurred where the Town Hall venue is concerned. In August of 1951, Billboard is reporting that Foreman had a three hour show over KECA-TV in Los Angeles. The show featured such acts as Betsy Gay, Marilyn and Wesley Tuttle, Merle Travis, Bill Sutton, Jack Tusker, Mary Lou, June Ray, Jimmy Widener as well as Hank Colwell. Billboard also reported that while Johnny Bond had been working with Foreman at the time, had left on a tour in the midwest with Billy Ellsworth. In 1952, Foreman Phillips sold the Town Hall dance venue in Compton to William (Bill) Wagnon which lead to the Town hall Party television show in later years. Gerald Haslam pointed out that the Town Hall Party was a three hour show over local Los Angeles television. Then, half-hour segments were packaged and retitled as "Western Ranch Party" when it began to be broadcast nationwide. What gets interesting or confusing is the blur related to the Town Hall Party. Mr. Haslam notes that when Rose Lee and Joe Maphis moved to southern California in 1952, Johnny Bond and Merle Travis recommended them to Foreman Phillips and noted they became regulars on the Town Hall Party. A 1956 article by John Tynan about Joe Maphis provides a few more morsels from this time. He indicates that in 1951, they got a phone call from Foreman Phillips, inviting them to join his KABC-TV show. They accepted that offer and "..stayed with the Phillips show till he retired about four months later..." when they moved to Cliffie Stone's Hometown Jamboree heard over KXLA. Later, they signed up with Bill Wagnon to appear on the Town Hall Party. In his book Mr. Haslam notes the passion and efforts that country music promoters like Foreman Phillips put into bringing talent in to entertain audiences. He likened them to gamblers, risking their own money if the gate proceeds from the audience didn't cover the guarantees to the artists. Foreman was one such person, and others of that era included Cliffie Stone, Black Jack Wayne, Steve Stebbins and Stu Carnal. There are some sources that indicate Foreman "retired" after selling his lease at the Town Hall venue in Compton. But we continue to see him mentioned on the LA country music scene after 1952. Billboard reported that Tom Brennen was appearing at the Baldwin Park County Barn Dance in late 1953. In late 1954, another twist occurs. Les (Carrot Top) Anderson was to be the headline act on a new show led by Foreman Phillips at his Baldwin Park venue. It was to be called "County Barn Dance Jubilee" and first went on the air in November of 1954. The show was to include a cast of regular performers such as Red Murrell and his Ozark Playboys, Eddie Downs, Three Little Country Girls, Glen and Gary, Shirley Bates, Frank Simons and Tex Atchison. The show was to air over KCOP. Perhaps by the mid-1950's Foreman was beginning to slow down and fade from the 'live' performance arena. But we still read about him hosting the County Barn Dances that were held in Baldwin Park - as late as 1956. Hillbilly-Music.com wishes to express its appreciation to author Wayne W. Daniel for providing us with additional information based on his research of Billboard and Variety magazine articles as cited. We thank him for his long time and ongoing support and encouragement.